Sony Xperia XZ2 review: The best Sony phone in years, but is that enough to lead the flagship pack? A fresh new design, lots of power and a great display lead the charge. But the camera experience feels muddled, while the battery life isn't that great. However, it does offer better value for money than some rivals, making it one of the better Sony devices we've used in recent years. The biggest criticism of Sony's phones in recent years has been the company's dogged persistence in sticking with a design that hasn't moved with the times. OmniBalance, as the company calls it, has retained bezel scales well beyond its competitors. And while that design language evolved into what the company termed as Loop Design - not that you'll have likely noticed - its phones remained stoically monolithic. Well, rejoice, as now you can scrap all that. For 2018, Sony Mobile has truly changed its design ethos, with a new approach that it's calling Ambient Flow. Xperia is no longer a monolithic slab, with the Sony Xperia XZ2 a much more attractive and competitive device. But is too late to make a major impact, or has Sony got its flow spot on? 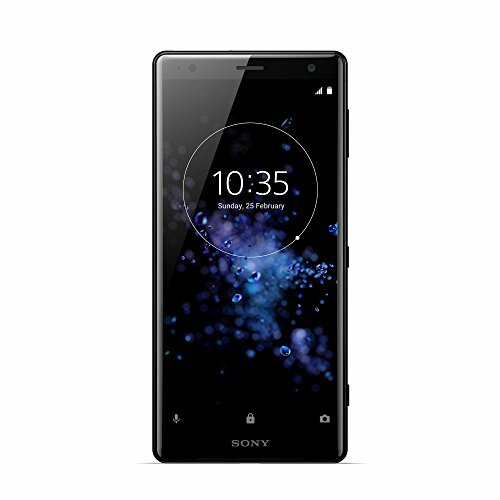 The Sony Xperia XZ2 replaces the XZ1 - a phone which barely had time to reach shelves. You can forget all about the XZ1 now, though, because the XZ2 betters it in all areas, as a flagship phone should. Or, if you want something a little smaller yet equally as mighty, then there's the also new Xperia XZ2 Compact. Not only is Sony embracing the 18:9 aspect ratio display in the XZ2 - meaning you're getting 13 per cent more screen squeezed into this handset then before - but there's a shift from the typical Xperia flat design, too. The aluminium edges to the XZ2 form a curve from the display front around to the rear; that rear is curved to fit into your hand, rather than being a slab of a device that bridges your palm. There's now a symmetry, with the fingerprint scanner and camera taking a centreline on the rear. That fingerprint scanner is in a bit of a weird place, sitting a long way down the body of the phone, so it doesn't feel as natural to use as the higher placement that's common on devices - like the Google Pixel 2 XL, for example - but it's easier to use than the older, side-mounted scanners from previous Sony handsets. The phone also features an IP65/68 rating which is very much a prerequisite for flagship smartphones these days, meaning it's protected in the rain and from spills. However, while the looks improve, the glass design means the XZ2 can be a little slippery, so it can slide off surfaces and things. It's not a fan of sofa arms. Or window ledges, it seems. We would advise sticking a cover on it to avoid dropping and smashing it (fortunately ours has remained in one piece). Sony has long stuck to its guns regarding resolution. While it is one of the few manufacturers to offer a 4K display on a phone, Sony refuses to play in the "Quad HD" arena, arguing that there is no native Quad HD content, so you don't need it (there is on YouTube, as it's a format for capture on some phones and cameras, but hey-ho). So it's perhaps no surprise to discover that the Xperia XZ2 is a Full HD+ phone, with the new 18:9 aspect pushing it out to 2160 x 1080 pixels. Is there any content in that aspect? Well, no, but that doesn't really fit with Sony's narrative. Besides, 18:9 is the latest trend in mobile and we embrace the move as it makes for better one-handed use and banishes what used to be chunky bezel. Sony has had a healthy forehead and chin on its phones in the past - that space to the top and bottom of the display - but that's reduced in the XZ2, delivering a fresher and more competitive look. Sony hasn't taken the Xperia XZ2 as far as the iPhone X or LG V30 in reducing bezel, nor does it take on the curved edges of Samsung's Infinity Display. We levelled the same criticism at the 18:9 display in the Google Pixel 2 XL, so here's another company that should have been even more aggressive with the design. Aside from aspect ratio and resolution, the XZ2's LCD display also brings HDR (high dynamic range) to the story. This display not only supports mobile HDR content, but will also upscale content to HDR-like quality using Sony's X-Reality processing. Or, at least, that's what Sony says. X-Reality has been on Sony phones for a long time, and we while we like X-Reality's push in colours, we can't really say that on the XZ2 it feels that different to previous Sony phones. The HDR support is interesting: at the time of review, there's no support for HDR on Netflix, which is the largest potential source of HDR programming, so comparing to other devices is hard. There is HDR on YouTube, however, and this does look great - but there's no huge wow moment like you get on high-end content. These days there's a lot of praise for OLED displays, but Sony's decision to run with LCD doesn't come as a negative. There's natural colouration that we really like, with bright whites and punch to colours, as well as plenty of contrast. Next to popular OLED devices, it appears less saturated, and there are options to tweak the display for more vibrancy or closer to sRGB which Sony calls "professional" (and we really don't like). About the only thing that Sony struggles with is something that's been irking its phones for a while: autobrightness. You can unlock the phone and the display is so dim it's barely visible, taking a while to adapt and brighten relative to the ambient conditions. At night, conversely, it's sometimes too bright. This is a phone you'll probably have to keep tweaking to get the display exactly as you like it. Sony is right on the pulse of new hardware in 2018: the Xperia XZ2 launches with the new Qualcomm Snapdragon 845, one of a clutch of new devices to do so. In the UK the Samsung Galaxy S9 is using Exynos, the new Huawei P20 uses HiSilicon hardware, so Sony is pretty much leading the charge on mainstream SD845 handsets. The power is obvious too. Games load fast and play smooth. Multitasking is a breeze. Playing PUBG Mobile (on max settings) and we've found the XZ2 gives us a better experience than when playing on the Galaxy Note 8. Which is exactly what we want from a top-end phone. There's a USB Type-C port on the bottom of the phone, as well as support for Qi wireless charging. The 3180mAh battery within doesn't have a huge capacity given the size of the XZ2's body, which can show in use: this isn't a stamina champion. Stamina Mode still exists for battery saving purposes, but has been reworked in recent years. It now offers always-on or automatic activation at a particular point. You can set three modes based on your preference (battery life, balanced, performance) and Sony lists a range of things that are switched off in each mode. Scrolling through text gets juddery in some modes due to hardware throttling, so it's very much a case of finding one that works for you. There's also a lot in this phone that will eat battery: big speakers, added vibration, that HDR display, 4K HDR capture and super slow-motion video. All that'll drain the battery, so the XZ2 doesn't match the likes of the Samsung Galaxy S9+. There's also no 3.5mm headphone socket. Yes, Sony has followed another industry trend and ditched that venerable old connector. We're sure some will mourn its passing while awaiting USB Type-C headphones worth buying, but with Sony also making some of the best Bluetooth headphones available, we're sure you'll find an alternative. Or a dongle. Xperia XZ2 camera: Is 4K HDR capture exciting? That's right, the Sony Xperia XZ2 is the first smartphone to give you 4K HDR video capture. It leans on a custom image signalling processor co-developed with Qualcomm, giving you a 10-bit hybrid log gamma video (HLG) at the end of it. You'll need a an HDR-compatible TV or phone with 10-bit playback to get the most out of this. But increasing the bit depth means more data to ensure that colours are more accurate and there's better gradation, reducing the banding by upping the dynamic range to retain more highlight and shadow detail. In reality there are some caveats: HDR and SteadyShot (Sony's image stabilisation system, to counter those shaky hands) don't work in tandem. When you turn on HDR, it also crops the video window significantly, so you have a different view compared to that of normal capture. You can share HDR video via YouTube. Watching it back on another HDR-enabled phone (the Samsung Galaxy Note 8 here) it certainly looks more vibrant. Filming a Lindt gold bunny, the shine on the golden wrapping is much more realistic on the 4K HDR video than the normal version. Mission accomplished, then. But this HDR capture only really excels on static capture - move the phone and you'll get judder, plus camera shake (which isn't surprising as SteadyShot stabilisation has to be off). Beyond HDR, Sony has also tweaked its 960fps slow-motion camera, allowing Full HD capture. Again, this leverages the core power that this phone offers - but in doing so the capture window gets shorter. This gives Sony a resolution advantage over the Huawei P20 Pro or the Samsung Galaxy S9; it's also pretty easy to use, letting you film at normal speed then tapping at the moment you want super slow-motion. This way you can assemble the slow-mo moments you want, then edit the video. It looks great, but like other versions of this technology, it only works in bright conditions - attempt to use it indoors or in low light and you just get a grainy mess. For many, however, the real feature of a phone is the stills camera performance. In the XZ2 that's headed by a larger-than-typical 19-megapixel sensor and a lens with wide f/2.0 aperture. It's also a single camera, not the increasingly common dual lens setup, so there's no optical zoom, no wide angle. Sony leans on its Superior Auto mode, which recognises the scene and then notionally selects the best settings for the shot. It's been doing this for some time and while other manufacturers are actively talking about artificial intelligence (AI; used for auto scene recognition), Sony doesn't seem to be working that angle. HDR is also typically absent in stills. To activate it, you'll have to turn on the manual camera and open the settings to select it, whereas rivals are actively pushing auto HDR all the time. That presents a conflict: while talk of HDR for the display and video is so overt for the phone, for the camera it isn't. And HDR is probably the photography term that's resonating with consumers the most at the moment - especially given the performance of cameras like the Google Pixel 2. For it to be missing in normal auto shooting for Sony just seems wrong. Sony's camera app also feels a little dated: you can switch from manual to auto to video, but beyond that, Sony is still pushing camera apps. Some are pre-installed, like panorama, but if you want bokeh - think 'Portrait mode' for those software-based blurry backgrounds; yes, it's the other massive trend in smartphones - you have to install it separately. Once installed, it doesn't work very well either given the single lens solution, so it's a bit of mess compared to the (also limited) experience of other competitors. But the biggest performance gripe we have with the Sony Xperia XZ2's camera is autofocus. There's no touch focusing offered, instead it focuses when you press the on-screen shutter button or on a half-press of the dedicated camera button on the side of the phone. If you don't use that button on the side, things don't really feel right, so if you're moving from another phone, you'll need to remember that. The performance itself is pretty good otherwise, with plenty of detail and some nice photos which exhibit wide dynamic range (despite the lack of HDR references). But does the camera excel or standout amongst rivals? No, it doesn't. But, we suspect, when other makers get hold of this camera sensor hardware and adapt it to their needs, it'll spell the next-generation of quality phone cameras. Just not in this guise, yet. You give me good vibrations! The Sony Xperia XZ2 also boosts the speakers over the XZ1. There are two speakers in the front of the phone and they offer good stereo separation and volume. Sony also boasts S-Force surround to give you a more immersive experience. Although we think it's lost out in the branding wars here - the likes of Samsung and Huawei both boast Dolby Atmos, which is a brand you might more readily recognise, although the wide effect is pretty much the same between the two at this small scale. Then there's the Dynamic Vibration System. This is an enhanced haptic system that Sony wants to use to make the feel of the phone more visceral. Think of it like the vibration motors in a PlayStation Dual Shock controller and you're on the right track. This system can add vibration to anything you're watching. When you open a new apps that's supported, you'll be asked if you want it - if you don't, then it's disabled for that app. A virtual slider can adjust the strength of the effect, just like changing the volume. For music we found it's just a distraction that's weird, for video it doesn't really add much as it's based on audio rather than being linked to the content on screen, while for games it's a little better. Sony has been slowly reducing the software duplication in its phones and the Xperia XZ2 reflects a more stripped-back experience. Built on Google's Android operating system, the phone feels nicely Androidy without too much extra. There are a range of apps you'll be offered on startup (3D Creator if you want to map your face, anyone? ), with the choice to install them or not, but there are Sony apps for the gallery, music and videos. The only real use we found here is that the Album app will indicates which videos are 4K/HDR, which Google Photos will not. We've found the software experience to be smooth and stable, not too aggressive with notifications about features, but there is a demo available for just about everything when you open the phone for the first time. The Sony Xperia XZ2 is one of the better Sony devices we've used in recent years, representing a genuine push forward in the company's design stakes. Features impress for an enjoyable day-to-day experience. The LCD display really appeals, the 4K HDR capture impresses (as long as you have somewhere to watch it), and there's oodles of power under the hood to make for a slick and smooth running phone. However, the battery life does raise some concerns, as it's not the longest-lasting phone when you set it to task. Furthermore the camera, while it sounds super on paper, feels like it could be offering yet more. Dual lenses, an updated app with more contained within, easier-to-use focusing, a faster aperture, and so on would all help up the ante. As a 2018 flagship, Sony is offering a lot of phone for the price: it's cheaper than the new Huawei P20 Pro, Google Pixel 2 XL, or Samsung Galaxy S9. But can you accept a couple of compromises along the way? We suspect most will say yes (especially with the free PlayStation 4 bundled in for pre-orders). The Samsung Galaxy S9+ is one of the top phones of 2018. While it doesn't bring a new design over the S8+, it packs in plenty of power, a hugely refined experience from the Samsung Experience UX, and more features than you'll find in any other phone. It also offers a great camera experience that's fast to launch and packed with potential, especially in low-light conditions, so it feels like it's giving more than Sony is offering (although Sony trounces Samsung when it comes to video). You can't talk about camera phones without mentioning the Google Pixel 2. Ok, so the XZ2's design is more interesting, has more power and a punchier screen, but the Pixel 2 XL has a software advantage, as it's front of the line for Android updates.